Hi, friends! Some days I can’t believe I’ve been blogging here for five years! The time has flown by! I was going back through my archives and found some summer DIY projects from the early days that you may have forgotten, or if you are a newer reader, may have never seen! 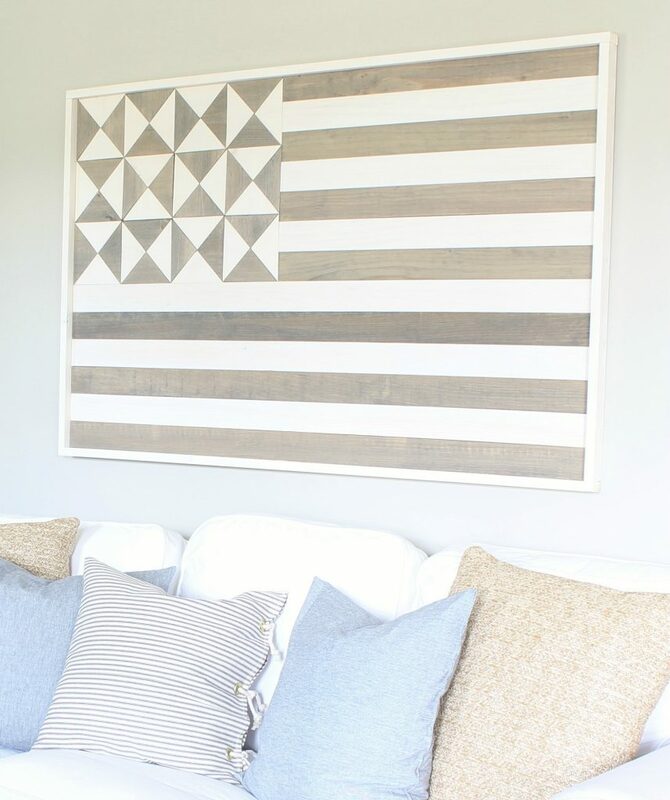 So, I decided to bring these 10 easy summer DIY projects to you today all in one place! I hope you will try one or more of these easy summer projects! Just click on the BOLD titles to see the tutorial for each project! 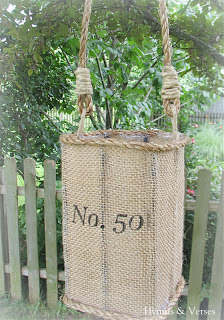 This is easy project with inexpensive jute rope and I share a step-by-step tutorial to make your own. 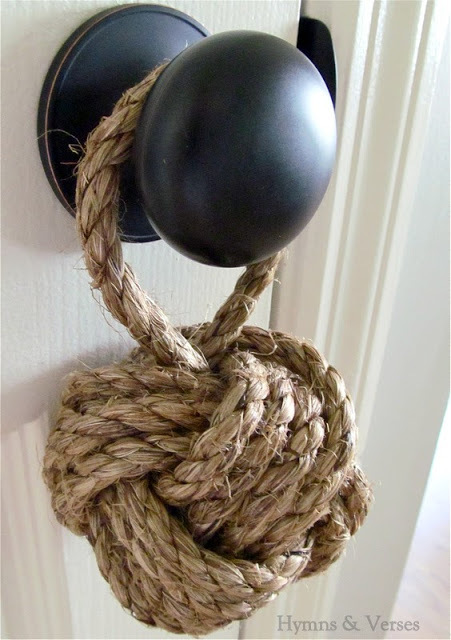 These rope knots are great to use in your summertime home decor! 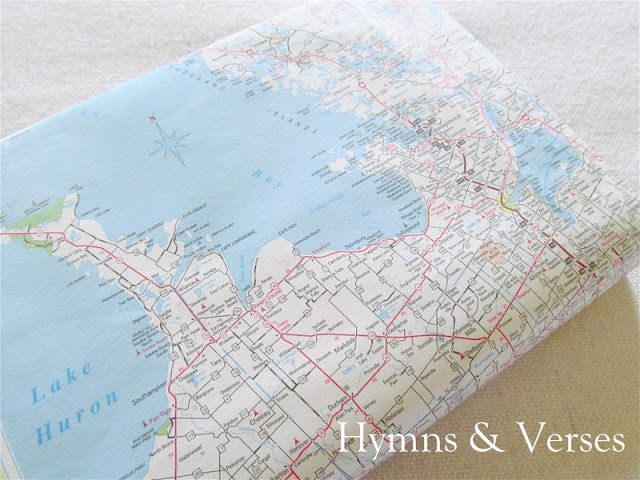 Give any book a nautical look by covering it with a map! 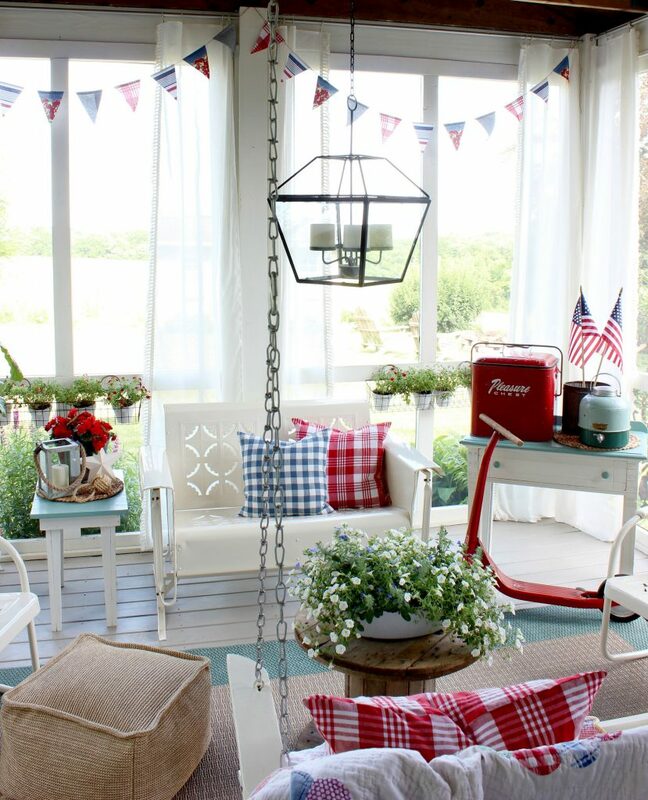 So, easy, yet impactful in summer decor! You say you don’t remember how to cover a book, that it’s been too long since you did that in school? No worries, I show you how it’s done and it will all come back to you! 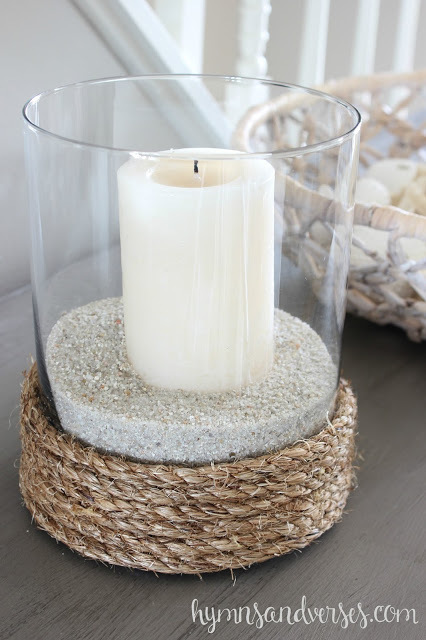 If you clicked on the title for this one, you’ll see that I really don’t have a tutorial to make these pretty beachy candle holders. They were made using inexpensive items I picked up at Walmart. I will link to the items from Walmart that I used next. It’s just jute rope hot glued to the base of a glass cylinder. The sand holds the candle in place and you can use a regular candle or a realistic battery-operated one. So pretty with some seashells or other nautical elements. A striped outdoor rug is always a classic and I made this one using a painter’s canvas drop cloth and Maison Blanche Vintage Furniture Paint in Navy. 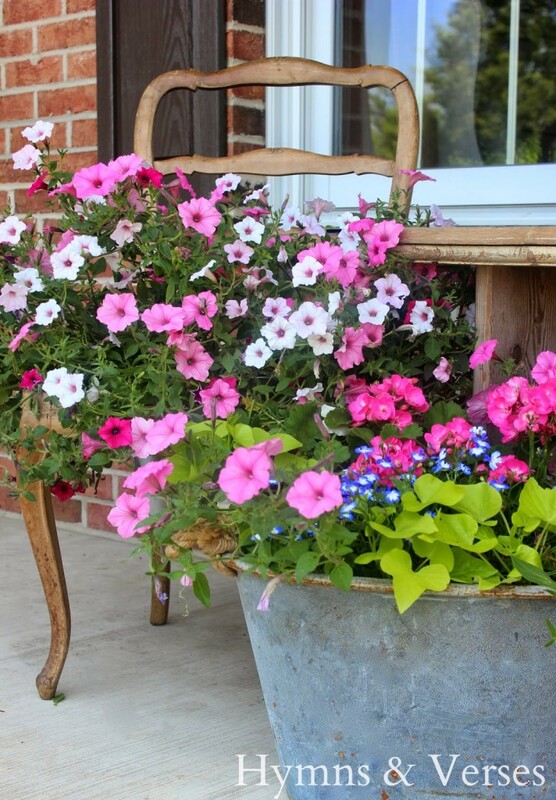 It held up great all summer and was an inexpensive alternative for my screen porch! This one goes way back to 2012 and was my very first tutorial here on the blog. It’s a hanging candle holder that is a knock off of one that Anthropologie sold. Can you believe it’s made from an empty iced tea container! This one is more recent! 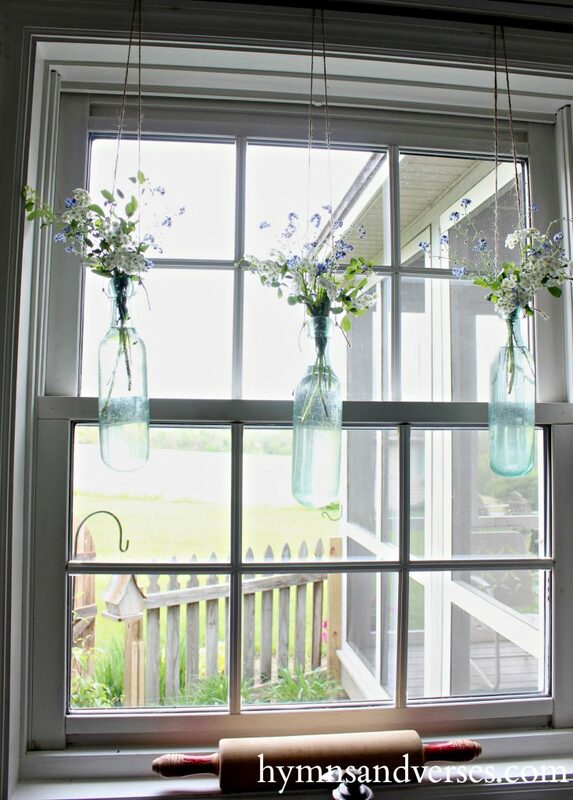 I used vintage bottles I found at a local sale, but you could use any glass bottle to get the same effect. I loved bringing in different clippings from my flower beds to display in my kitchen window all summer! Make your own fabric pennant banner with fabric patterns you pick yourself! And, this fabric banner won’t fray! I share the pennant template and a full tutorial! I used a vintage French chair that I got for next to nothing at a local auction to make this pretty planter for summer. Your chair doesn’t need to be “Frenchy” or “fancy”, this project could be done with any old chair that has seen better days! 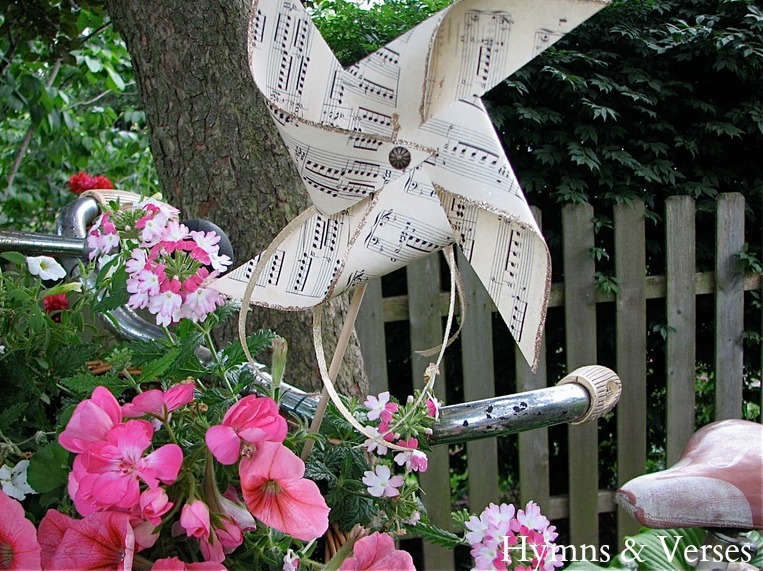 How fun is a pinwheel on a stick in the summertime! It’s a touch of fun and whimsy that you can stick into a planter or vase. The template I share makes this a quick and fun project that even the kids can make! Okay, so this looks complicated. But, the hubs recreated the expensive Pottery Barn design, and I gave you all the wood cuts and tutorial to put it together. It may take a little longer to make than the other projects I shared, but is so doable if you are comfortable with a table saw! 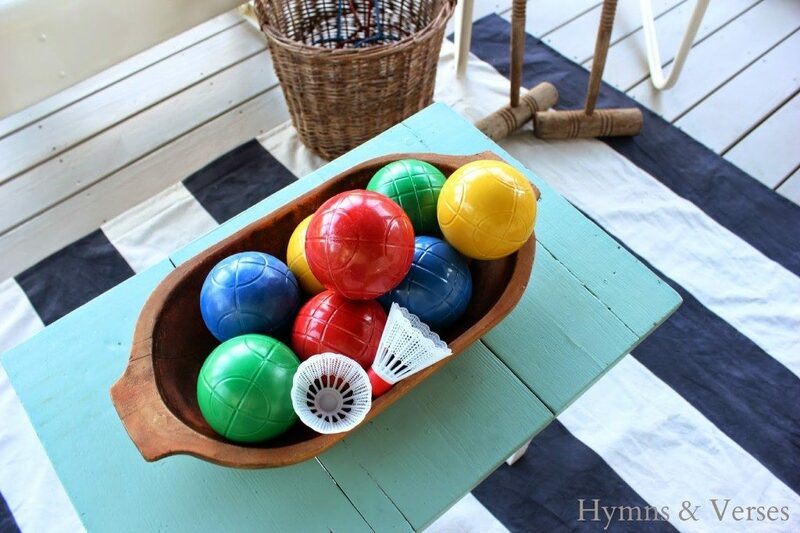 I hope that I’ve inspired you a bit today to get your summer DIY on with these ten DIY projects from Hymns and Verses! I’d love to hear if you’ve made any of them in the past! Now, I’m heading outside to work on my latest summer DIY project that I hope to share soon! (hint – it’s something on my screen porch) Have a great day! Oh these all look amazing. I definitely have to make some of those rope knots. Some brilliant projects here. Thank you. Wow, there is so many cool DIY project. Especially the beach candle holder, it looks so natural and mind-blowing. Thanks for sharing this idea.